Have you dreamed of walking through the English countryside? You can, with a custom made Foot Trail. Our 2019 brochure is now live and we are open for 2019 bookings. With 55 pages of trails, inspiration, ideas and suggestions you can walk and dream your way through each page, discovering who Foot Trails are as an organisation and how to work with us to plan and arrange your English walking tour. Alison Howell’s Foot Trails are a small company with a big heart. Walking here is a simple yet rewarding adventure. Our walks take you off the beaten track, away from national trails and tourist destinations and through authentic villages and countryside. On the way you will stay in one or more of our personally chosen country inns. Each are located in English villages with beautiful countryside steps away. 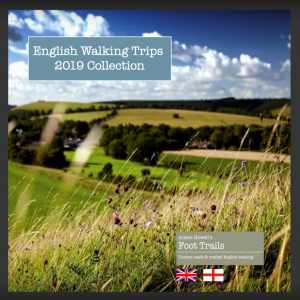 Foot Trails offers unique, custom made walks in six of South West England’s seven counties, including Wiltshire, Dorset, The Cotswolds, Somerset, Devon and Bath and Avon. I want to find short pretty walks in England: 1-2 hours of walking, or less. Can you tell me what and where these short walks are? I just want short rambles. Not in big cities. Do you do a ‘physical printed’ brochure at all rather than emai/on line one? Please. Gift vouchers or gift experiences? Sign up to our E-Newsletter to receive walking advice by email, travel insight and top tips from our award winning team of walking experts and Founder Alison Howell at one of England's best loved regional travel walking companies. This entire web site and its content is copyright Foot Trails.